Two separate bones in the lower forelimbs (ulna, radius) and the lower hindlimbs (tibia, fibula). Recent phylogenetic studies placed the primates into the Clade Euarchontiglires with the tree shrews, colugos, rodents and lagomorphs (Springer et al. 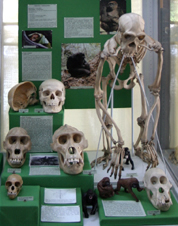 2004, Trends in Ecology & Evolution, 19, 430 - 438) and confirmed earlier classifications, based on morphological and physiological features, that divided primates into two main groups (Purvis 1995, Philosophical Transactions of the Royal Society of London, B, 348, 405-421) commonly called the lower primates and the higher primates. The lower primates or strepsirhines (suborder Strepsirhini) include lemurs, bush babies, lorises; the higher primates or haplorhines (suborder Haplorhini) include the tarsiers, Old and New World monkeys, apes and humans. Strepsirhines have moist noses; haplorhines have simple, dry noses. Strepsirhines have longer snouts, smaller brains and a more highly developed sense of smell than haplorhines. Haplorhines have shorter faces, larger brains and a more highly developed sense of vision than Strepsirhines; their eyes face more forward than the eyes of strepsirhines. The different lines of primates show gradual changes in the hands and feet - the evolution of sensitive pads for gripping on the underside of fingers and toes and increased mobility of the digits for grasping objects. These changes culminated in the development of the human hand and a thumb that can rotate to oppose the fingers. 1. Infant lemurs. Photograph courtesy of Alan R. Thomson, copyright The Royal Zoological Society of Scotland. 2. Spectacled or Dusky Leaf Monkeys photographed bt the authors at the Royal Zoological Society of Scotland. 3. Bornean orang-utans photographed at Sepilock, Sabah (courtesy of J. Glendinning). 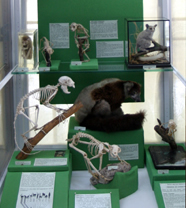 Suborder Strepsirhini � lemurs, aye aye, bush babies, lorises. New World Monkeys � marmosets, howler monkeys, spider monkeys. Old World Monkeys � guenons, macaques, baboons, langurs. Apes � gibbons, orang utans, chimpanzees, gorillas, and humans.